Ever received a brochure, booklet or other piece of mail that appears to be cracked along the folded edge? This sometimes occurs with full coverage ink or digital toner when the document is folded unless precautions are taken in advance. There are three items to consider: Coated papers, toner vs ink and paper fiber orientation. Ink soaks into uncoated paper and digital toner adheres to its rougher surface. Adhesion ability is reduced with a coated paper for both ink and toner. You may get the glossy or satiny finish you like, but you may also experience cracking through both layers – coating and ink or toner. 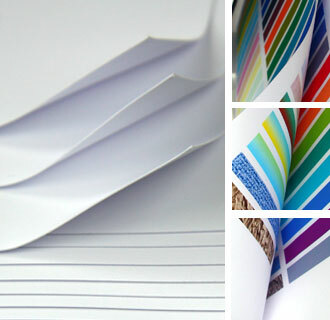 Specially coated papers will work with non-water-based inks and there are specific papers used with toner based printing. Should I Choose Toner or Ink? Most digital toners are made of plastic or wax powders that are fused to the paper using heat. Water or alcohol based inks are commonly used on home inkjet printers; these inks soak into uncoated paper before drying. Glossy printing on a home inkjet printer can only be done using specially coated photo papers. Commercial printing presses use oily inks that adhere to the paper much like paint. Paper is made of wood or cotton fibers and are directed in one direction, although papers such as tissue or the 20# bond you probably use in your office are non-oriented. To determine the orientation of your paper do a tear test. Tearing with the grain produces neat, parallel strips, against the grain ends with ragged and unpredictably shaped pieces. Take a piece of paper and tear it both on the short end and the long end of the paper to test. For short print runs you will most likely want to choose digital printing. The first line of defense to prevent cracking of toner based pieces is to design without full toner coverage where the fold is to occur. Heavier stock such as card or cover, should be scored whether or not there is toner at the fold line. 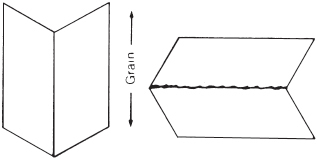 Ask your printer if they have a stock that can be run with the grain oriented to fit your fold configuration. Often times a larger sheet paper can be used although the price may be a bit higher. You could also employ the use of special coatings such as UV, varnish or aqueous. UV coating requires the use of a special ultraviolet light. All three options are available as either “spot” or “flood” coating. Make sure to use your vendor’s expertise during design and paper selection. They will be able to steer you to the best possible outcome! You’ve done it. You and your team have formed an alliance of the best of data, design and technology and brought forth the perfect mailpiece, a scintillating message that will bring you the ROI of your dreams. It is ready for launch. Beware! Between home port and the final destination, a fearsome danger lurks: The Mail Eater. It will shred your envelopes, mangle your budget and sink your dreams. But do not despair, there is something you can do to defend yourself. The Mail Eater is nothing more than the machinery the USPS uses to process mail in a swift and cost-effective manner. Properly prepared, your mailpieces will sail through unscathed. But the unwary will fall prey to being macerated, rejected or slapped with the higher cost of manual processing. What is your Aspect Ratio? Take the length of the mailpiece and divide it by the height. If the answer is between 1.3 and 2.5, take heart, your message’s journey will be blessed. If not, it will meet its doom. 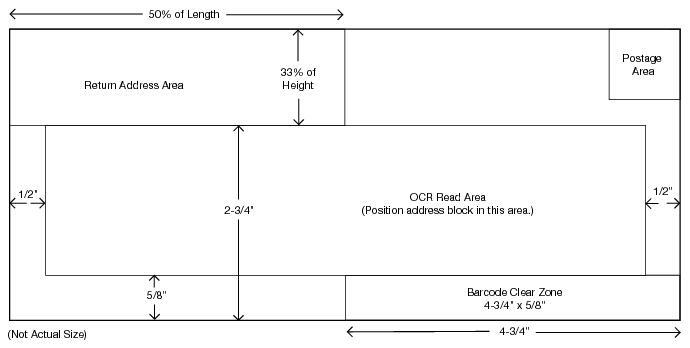 What is your mail piece thickness? Letters must be a minimum of .007 thick, or 0.009 inch thick if more than 4-1/4 inches high or 6 inches long or both. Thin paper makes poor armor against the speed and impact of the postal machines’ maw. What are your barcode reflectance properties? What do you mean—background reflectance, print reflectance difference or opacity? The automation machines must be able to distinguish the printed barcode from any background designs or print showing through the material of the envelope. It is essential to refer to the USPS DMM code 708.4.4 to combat these issues. It may seem daunting, but be brave! These answers and more are found in the USPS Quick Service Guide at http://pe.usps.com/. Congratulations, you have now equipped your message to face and conquer the threat of physical damage and increased mailing costs. Good luck, and may the post be with you! If you’ve ever considered using Personalized URL as part of your mail campaign, here are some helpful tips we’ve compiled. Start with a new domain name. You can use Go Daddy’s bulk registration tool to see which ones are available to you. Get creative and tie your domain name into your campaign vision. When crafting your PURL message, don’t offer too many choices to the respondent. Give them one offer or one premium, not 10 different offers. When a respondent has to stop and think over an offer, they are more likely to click away and never respond. Keep the landing page clean, simple and relevant. Don’t crowd your message or add distractions. White space is your friend here, just as in a direct mail piece. Get them to the submit button as quickly and painlessly as possible. Only ask questions that are absolutely necessary; oftentimes you can get some of this information after they respond. If they are able, ask your PURL vendor to customize the thank you page and email follow up as well. Personalization goes a long way in increasing response and customer loyalty. A PURL offers valuable information. You can track who visited their landing page and responded, who visited but didn’t choose to respond, and who didn’t visit at all. Each type offers unique insight to the effectiveness of your marketing, allowing you to tweak future communications to prospects and clients. How do you see yourself using PURLs to enhance customer communications? We’d love to hear your feedback. Add A Splash Of Color To Your Day! Come join the Strahm Automation & Mailing Open House from 3-6pm TODAY!! Introducing our new Océ ColorStream 3500 Inkjet Printer. This video showcases the newest addition to the Strahm Automation & Mailing family: Océ ColorStream 3500 Inkjet Printer. It provides sharp, full color CMYK printing, even printing duplex simultaneously. This high speed printer can produce up to 1,000 letter size sheets per minute. Added to that is the ability to perf – both horizontal and vertical – and trim in line. What can’t this workhorse do? With the Océ ColorStream 3500, Strahm gains the ability to more effectively respond to ever-changing customer demands, resulting in a finished product that delivers on expectations. At the same time, cutting edge technology and low-waste operation allow Strahm to pass savings along to customers. Mr. ZIP And The Zip Code Turned 51! How Much Do You Think About ZIP Codes? It’s just a string of numbers you add to your letters, cards and packages, right? There is a whole history, and a pretty cute character, that helped educate your parents and grand parents on how to use these codes and improve mail service. In July 1963, the postal service implemented the Zone Improvement Plan or ZIP code as it is commonly called. The ZIP code is comprised of 5 digits specific to an area. These codes assist in routing mail efficiently for the USPS. Predicting that the public would be less than enthusiastic about memorizing not only their ZIP code, but those of family and friends, the USPS introduced Mr. ZIP in late 1962. Mr. ZIP appeared on buttons, signs, magazines, and even the edges of a sheet of stamps. The point was to educate the public and ingrain the use of ZIP codes to all mailers. Including a ZIP code promised “space-age speed”. 51 years later and Mr. ZIP stands as one of the most successful ad icons of all time. The USPS notes that by 1967, 80% of all Americans recognized him and knew what he stood for. Mr. ZIP was retired in 1986, but last year (2013) was the 50 year anniversary. As expected, he has been popping up all over the place. He even has his own page on the Smithsonian’s National Postal Museum website. This simple doodle was able to move the general public into participating in the Zone Improvement Plan – which increased efficiency and speed for the USPS for generations to come. Please enjoy this video from the mid-1960’s starring our friend, Mr. ZIP! Occasionally readers ask me why I spend so much time reviewing postal rules and regulations. Most often these questions are regarding meeting Move Update requirements, specs for postcards, self-mailers and letters vs flats. In the news this week were two good examples of why understanding these regulations is crucial. The postal service hit Southern California Edison with $7.6 million in penalties for allegedly not keeping its address lists up to date. The postal service noted a “suspiciously high increase” in the amount of undeliverable and return-to-sender First Class mail SCE sent between 2006 and 2008. SCE acknowledged two errors in managing its address correction procedures. These errors showed up in missing apartment or suite numbers and how to handle fractional number street address (such as 29 ½ Elm Street). They contend that these instances did not cause an appreciable increase in bad addresses. The postal service ordered a refund of postage discounts SCE earned for mail presented between May 14, 2007 and November 26, 2008. The estimate was 82 million pieces of mail at a total penalty of $7.6 million. The second news story involved Sears allegedly violating rules for folded self-mailers. The trouble was over the placement and type of seals used on 6.3 million folded Standard Class self-mailers sent out for promotions in 2009. 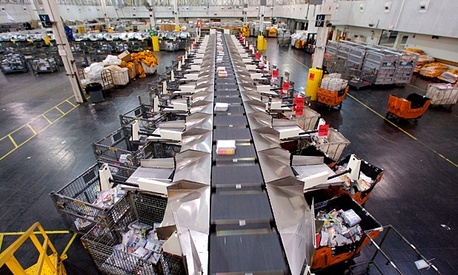 Sears stated that the pieces met postal regulations or were specifically approved by postal officials because they were designed not to jam letter sorting machinery. USPS determined that the pieces needed a second tab and that some were improperly sealed with glue instead of tabs. Sears was dinged with $1.1 million for the alleged violation. Both Sears and Southern California Edison have filed appeals of the USPS decisions with the U.S. District Court in Washington. Keeping up-to-date on postal rulings and regulations is no laughing matter when your company is fined for non-compliance. 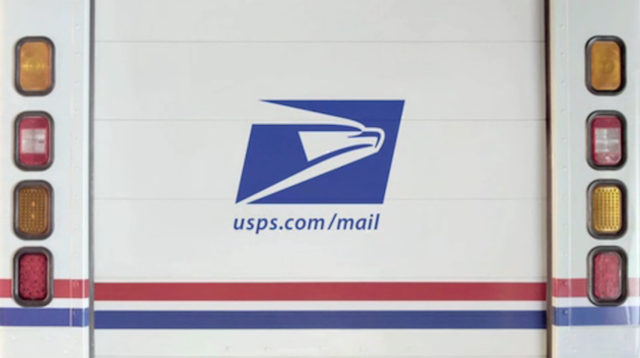 Please reach out to USPS Mailpiece Design Analysts and/or your outsource mail vendor. Both are there to help guide you through maximizing your mailings. Make sure you are reaching your audience wherever they are. Place a sign up form or guest book at a convenient location within your business. Add a button to your website and Facebook page to join your mailing list. You could even use a QR code which allows a customer to join a list by scanning the code – add this to a business card, flyer or point-of-sale sign. Your customers are connected through multiple social media channels, make it easy for them to connect with you. Don’t require customers to give you too much information. Especially if they are joining using a mobile device, ask them for only the information you truly need. If you need a geographic location, perhaps ask only for a zip code instead of a street address or phone number. While an email address is really all you need, additional information will aid you in more targeted marketing. Just don’t expect a consumer to give you their life story in data; be respectful of their time and effort in connecting with you. The very best subject lines-the ones that get opened the most every time-are the ones that tell exactly what’s in the email. A good subject line should be as brief as possible (maybe 50 characters, including spaces), accurately reflect what is inside and motivate the recipient to open the message. If this were in your email box, would you be likely to open it? While good writing does matter, email does allow you to speak in a more casual voice – just like any other social media. Your customers are people too, write like a human and drop all the sales jargon and techno babble. You can be funny and loose and still get your message across. The body of the email should include a clear call to action. Make sure your message contains relevant content and has a compelling reason to act. Include links and make sure they are tracked so that you can continue to market to people who have shown interest in the past. No that some of your customers will access your email via a mobile device. 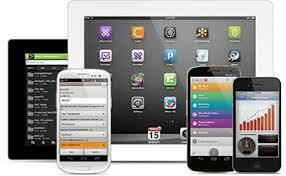 Make sure you know how your email is delivered and displayed on various different mobile devices. Targeting by location is a great tool for mobile marketing. Make sure your list is kept up to date and clean. It is irritating to receive a message with someone else’s name, location or buying history. Customers only interested in one product or part of your business may not be interested in hearing every message you send. Maintaining separate lists by customer interest or preference helps you tailor email messages and campaigns. If you need more customer data to properly segment lists, use a survey as a quick way to get people’s opinions or interests. For customers, it’s visual, it’s interesting, and it takes just a second to answer. Once you’ve got a good pool of responses, you can create new lists based on your results. Spray and pray emails will never perform as well as tailored emails to particular customer segments.” Segmentation allows you to create targeted email campaigns based on behavioral information or other contact data you know about each recipient. Surveys also help to determine the right tactic for each customer group. This can be done through A/B testing, which tracks the performance of two or more entirely different versions of an email message. Try a soft-sell message to your active subscribers and offer a significant discount to those that are less active or haven’t clicked lately. As you gain more data – and more insight – about your customers, update to manage customer segmentation. Utilize purchase history, click through rates, and additional data gathered through previous marketing campaigns. Test new messages, new formats and even new segmentations as you improve on your data list.